The California legislature is considering a proposed bill that would allow developers to build apartment buildings up to 85 feet tall (5 – 8 stories) with higher density within a half-mile of train stations (equivalent to 10 minute walk) and a quarter-mile of high-frequent bus stops. Many of the affected areas are currently restricted by local zoning to single-family homes. To effectuate these changes, the bill would pre-empt local zoning rules, precluding local communities from diverging from the minimum height or density minimums in the bill but otherwise able to set design and other zoning rules. The provisions would apply only to parcels of real estate already zoned for residential use and historic-building protections and affordable housing requirements would still apply. Transportation generates 1/3 of carbon dioxide (CO2) emissions in the US and studies have found that people living in compact cities have smaller carbon footprints than those living in sprawling cities or wider urban areas. For example, those living in dense San Francisco, which has wide public transport, emit on average 6.7 tons of CO2 per year, in contrast to the broader Bay area where people emit 14.6 tons, in large part because of long commutes. The legislation would create compact neighborhoods near public transportation substantially reducing long gas-guzzling carbon-producing commutes and helping California to meet its ambitious greenhouse gas (GHG) emission reductions. It would also help address the critical housing shortages in key communities throughout California as a result of the lower building and maintenance costs of higher density housing. The sponsors of the bill expected broad support, especially from the environmental community. Elsewhere we need to look no further than the UK Conservative government’s efforts to take away local control over decisions on fracking and wind farms. Or the Irish government’s deep frustration with the some local opposition to the huge Apple data center in Galway. Of course, transit-oriented density development can be created and managed by local communities, and there are many useful case studies of such planning. Assuming the troubling state preemption of local control over height and density zoning issues is addressed, there remain many concerns about increasing density, e.g., higher buildings, stress on existing infrastructure, overcrowding, destruction of the look of a traditional neighborhood. Of course, density does not necessarily mean structures higher than what currently exists in the particular community or neighborhood. Infrastructure can, and must, be built to accommodate more people, regardless of what housing they use. And cities can be densely populated without being overpopulated. Singapore is a small island with a high population density – about 10,200 per sq km – but is not considered overpopulated. Of course it helps to be a wealthy city, as we can see by the contrast with one of the most populated cities, Dhaka, Bangladesh, which has a density of 44,500 people per sq km and which most people would consider overpopulated. Dublin has provided for taller and more dense buildings near several transit centers, e.g., Connolly and Heuston rail stations, but the exception to low-rise buildings is limited. And living accommodations will be needed for a projected increase in population of up to 400,000 in the greater Dublin area by 2031 and up to 286,000 in Dublin city. This growth reflects the movement of over 70% of the world’s population to urban areas by 2050. The challenge is how to provide affordable living spaces for this growth, and to prevent the unfolding disasters associated with climate change that will threaten these living spaces. The choice does not seem complicated. Either this crush of more and more people will live in higher, more dense buildings or they will spread out over the surrounding countryside, at least in developed countries where people migrating to cities can afford to spread out. In developing countries the bulk of those migrating to cities are the poor who are crushed into shantytowns within the cities. 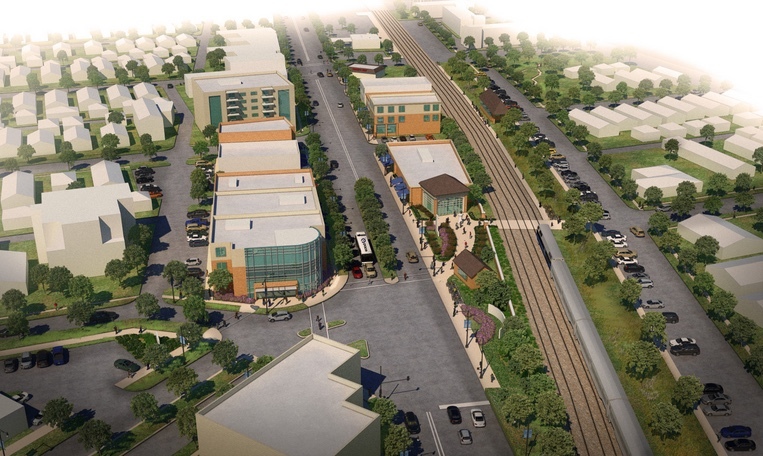 In any discussion of what needs to be done to meet this challenge, transit-oriented development, with higher residential densities, offers significant benefits and deserves a hearing.